On Monday night, approximately one thousand people gathered at the foot of the Temple Mount for the World Creation Concert. However, what took place was not merely wonderful music accompanied by a spectacular light show: the event actually encapsulated several prophetic incidents taking place at once. In the not-so-distant future, the event may be identified as the moment a new, Biblically correct United Nations was established, potentially leading to a new era of global cooperation. The Sanhedrin and the Mikdash (Temple) Educational Center hosted the World Creation Concert at the Jerusalem Archaeological Park – Davidson Center, arranging for it to take place one day before the 25th of the Hebrew month of Elul, the 5778th anniversary of the creation of the world according to Jewish tradition. The motive behind the timing was to give the event universal significance. The Temple Mount was chosen as the location because, according to Jewish tradition, the creation of the world began at the even shtiya (foundation stone) that lay under the Holy of Holies in the Temple. The connection between the Temple and the creation of the world was beautifully presented throughout the concert. The music followed the six-days of creation with some sections accompanied by choral presentations of Psalms that mirrored that particular aspect of creation. 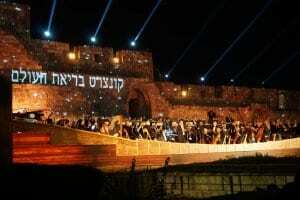 The creation of light was played while images of the gold menorah were projected onto the ancient walls. The creation of the oceans was accompanied by images of the Sea of Solomon, the brass laver that was used to wash the hands and feet of the priests before they performed the Temple service. Perhaps the most powerful image was also the most low-tech element. At several points during the performance, the musicians rested their instruments while Kohanim (Jewish male descendants of Aaron the priest) mounted the ramparts in full priestly garb. The blasts of shofarot (rams’ horns) and silver trumpets prepared for use in the Third Temple echoed in the night, recreating the glory of the Temple as it appeared 2,000 years ago. One non-musical element of the concert was powerfully prophetic. For several months preceding the event, the Sanhedrin had worked to contact foreign governments, inviting them to take their place as representatives of the 70 nations who populated the world, listed in the Bible as the grandsons of Noah. Honduras, Guatemala and Mexico answered the call, sending high-ranking delegations to attend. Rabbi Hillel Weiss, spokesman for the Sanhedrin described that the concert has a vital role to play in helping the nations of the world in joining together to address these universal threats the world today. The Biblical Sanhedrin in Jerusalem was a gathering point for universal cooperation and justice. The high-point of the concert came when the foreign representatives went up to the stage to sign an agreement with the Sanhedrin. By signing, the nations acknowledged that they were answering a call by the Sanhedrin of Israel to accompany the people of God, as peoples, nations, and individuals toward establishing the Temple in Jerusalem as a house of prayer for all nations as prophesied in the Bible. “We, as representatives of our nations, declare that according to the laws of Torah that God to Moses at Mount of Sinai, and according to the prophets of Israel and all the books of the Bible we wish to accompany the people of God, the people of Israel, to the place chosen by God, the Temple on Mount, Moriah, the place of binding the of Isaac. We are all gathered together in the name of peace and love with the people of Israel in the courtyards of the House of God as the sages of Israel and to fulfill the messianic vision of peace. God blessed Abraham by saying, “They that will bless you will be blessed”. We pray that by blessing Israel today, we, in turn, will be blessed. Rabbi Weiss told Breaking Israel News, that representatives from several other nations have already contacted the Sanhedrin about the declaration. Mordecai Persoff, head of the Mikdash Educational Center and one of the concert organizers, was pleased with the outcome of the event, noting that it accomplished far more than was apparent to the casual observer. Persoff cited the Talmud, which states that after the Sanhedrin was disbanded after the Temple was destroyed, music left the world. One group of Christians understood the prophetic implications of the concert and after reading about it in Breaking Israel News, decided to send representatives from their congregation, the Whole World Fellowship in Oakton Virginia, to attend. 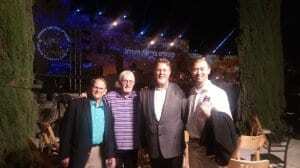 The concert was so clearly a prophetic “must-see” that the four representatives, Pastor Pitts Evans, Kurt Johnson, Yushik Seo, and Nancy Majette, flew in to Israel for 48-hours, solely to attend the World Creation Concert. Seo cited several examples of historic periods when Christians became stronger in their faith that coincided with high-points of modern Israeli history. Johnson agreed, quoting the Biblical verse that states that those who bless Israel will be blessed in return. “It is clear that we need the Sanhedrin to act as an interface between faith and politics in order to spread this blessing even further in the world,” Johnson said. Pastor Keith Anderson from Texas attended the concert, but stayed longer than 48 hours so that he could visit his many friends in the Holy Land.